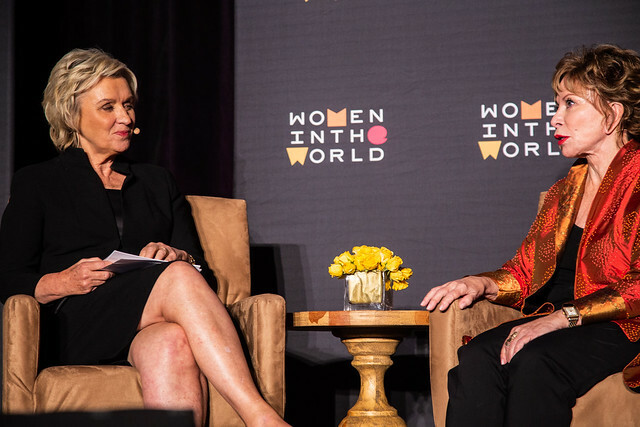 On November 5, Women in the World kicked off its Dallas forum co-hosted by Toyota and legendary journalist, Tina Brown, on the eve of the midterms Monday at the Dallas Museum of Art. Women who are on the front lines all over the world come to the stage to tell their stories at these summits and salons. Women in the World is the premier showcase for women of impact and for the men who champion them. Women in the World Host Tina Brown mingled with speakers Isabel Allende, Jara Butler, Paige Chenault, Rev. Leah Daughtry, Minyon Moore, and Dr. Viktoria Vibhakar, moderators Alisha Laventure, and Caroline Modarressy-Tehrani, Toyota Executive Lisa Materazzo, and guests including, Susan Posnick, Margaret Stafford, Stephanie Seay, Annika Cail, Cheryl Alston, Laila Muhammad, Alanna Sarabia, Susan Strauss, Lesli Levine, Karla Noone, Marcella Generalovich, Kellie Rasberry, Liz Standley, Rebecca Marabito, and Natalie Westbrook. The evening began with political power brokers Leah Daughtry, CEO of the 2008 and 2016 Democratic National Conventions, Minyon Moore, the former CEO of the Democratic National Committee and director of White House Political Affairs, and Jara Butler, political outreach director for the Beto O’Rourke campaign, took to the stage to talk about why the Democratic party needs to reward and return the loyalty that black female voters have shown it for decades. Following the discussion, The Birthday Party Project founder Paige Chenault, was anointed as the 2018 Dallas Toyota Mother of Invention and granted $50,000 by Toyota Executive Lisa Materazzo to help in her heartwarming mission to provide birthday parties for homeless children across the nation. The audience also heard from Dr. Viktoria Vibhakar, a courageous whistleblower who has risked everything to shine a light on the Australian refugee crisis. The evening concluded with a candid discussion between Tina Brown and Isabel Allende, the American-Chilean novelist who has sold more than 70 million books, been awarded the 2014 Presidential Medal of Freedom and will receive an honorary National Book Award for her life's work next week. Allende spoke about being a weaver of compelling stories and her empathy for the pain of refugees. Following the program, the audience networked, mingled, enjoyed a glass of wine and had the chance to get signed books and chat with the authors they had just heard from: Isabel Allende, whose most recent novel is In The Midst of Winter, and Minyon Moore and Leah Daughtry, co-authors of For Colored Girls who have Considered Politics. For a full recap of the event with videos, please visit www.WomenInTheWorld.com. The Salon was generously supported by Presenting Sponsor Toyota, Supporting Sponsor AT&T, and our Partner Ellevate.